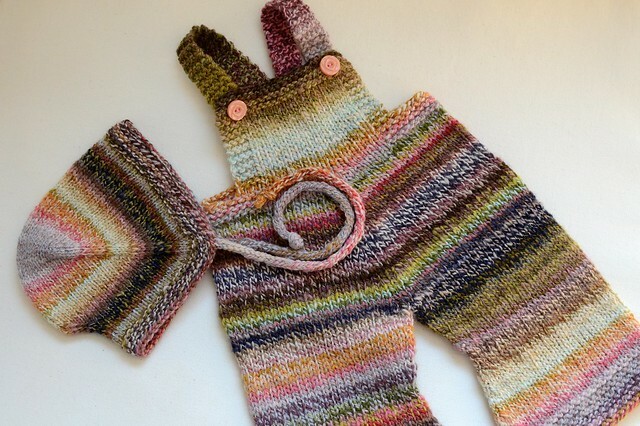 I love it when a fellow wool person has a baby and I can make hand washable baby clothes without worrying that they won’t be loved. In my book, there’s really nothing better than a fat baby tummy covered in smushy wool, so cover babies’ tummies I do. I can’t say enough good things about these overalls. I mean, could they BE any sweeter? The pattern is clear and simple and the end product is a delight. 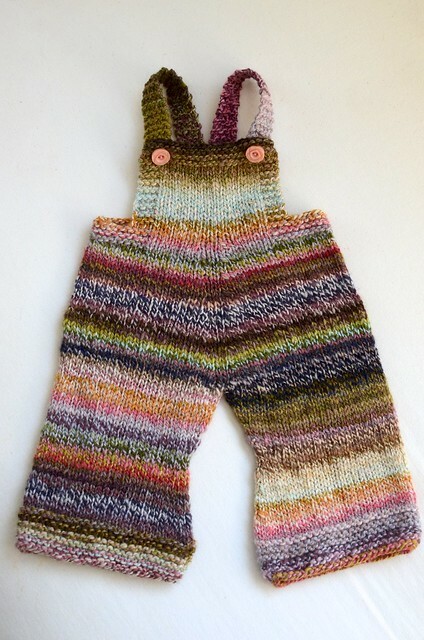 After I made these, I was shown a blog post about knitting a crotch gusset, which can only be a good addition, when one considers how much diaper sits in between a baby’s legs. The more room there, the better. These are knit at a pretty loose gauge, though, so the fabric is plenty stretchy to function well as written, I suspect. Size: I made the 6-12 month size in the overalls, but a bit stubby. They’re 16″ tall, including straps. SO TINY. I made the baby size in the bonnet. I’m really pleased with the random coloring of this yarn. 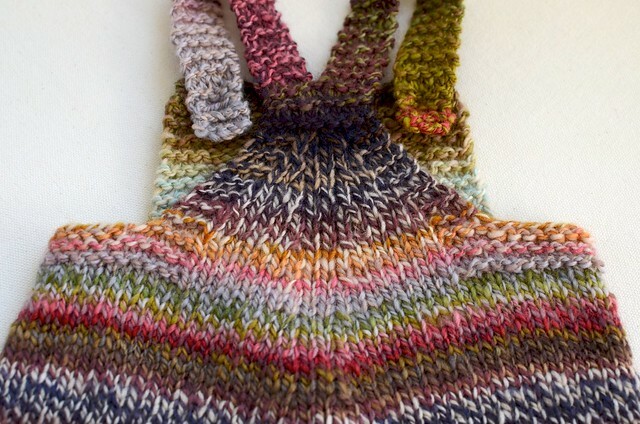 It’s made from scraps of at least 4 different colorways of Hello Yarn fiber. One ply is super soft stuff like Merino and Rambouillet, and the other is stronger stuff like Falkland wool and Corriedale. 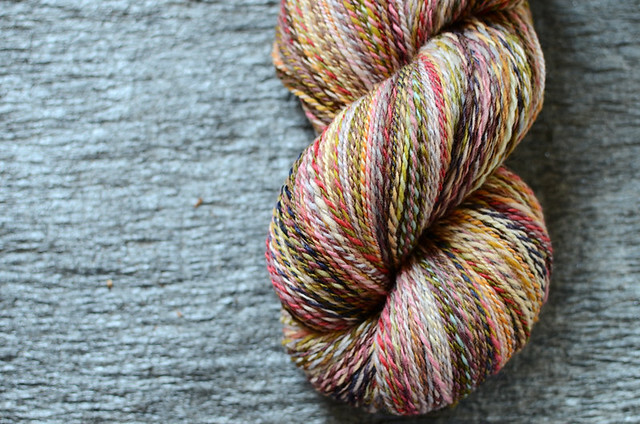 I chose the fibers based on color and had no problems with the combination of breeds. I figured if the shorter fibers puffed up, that ply would just be chubbier. The yarn was finished gently, with just a soak in lukewarm water and no agitation. I spun and plied it it a bit loosely, hoping for a light and puffy yarn, which was the result. The fact that I got a whole pair of overalls and a bonnet out of 4 oz. attests to that! Oh, hey, and there’s a whole new website! I’ve tried to move all the important stuff over from the old one, but I did ditch my blog posts from before 2007, as it really wasn’t that interesting back then and I doubt anyone ever looked. If you notice something that you loved is missing, let me know! Something happened to the blog categories (as in, they didn’t make the transfer). I’ll work on that. All the patterns you used to be able to download from my site are now available only on Ravelry. You can access them through the Pattern menu above. It seemed redundant to host them here as well as Ravelry and an informal Twitter poll indicated that pretty much everyone thinks that is exactly what Ravelry is for. I plan on blogging a whole bunch, including about the building of our new studio. If you’d like to read about it, you can update your RSS feeds over in the sidebar. Omg rosemary will be so happy!!! !